Relationships: Is it normal to have a favourite child? 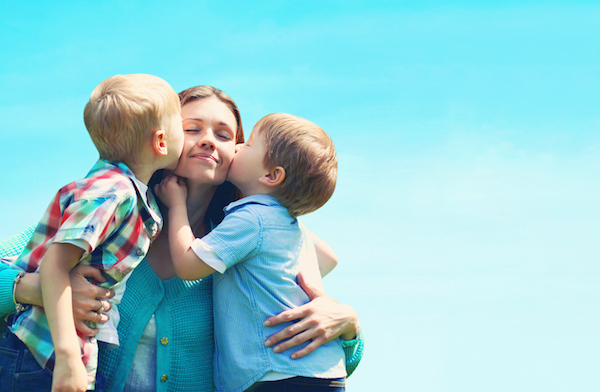 Posting on the popular parenting forum, this mum says she’s struggling with her feelings about her children and feels terrible that the bond with her youngest is much stronger than with her firstborn. “I am ashamed to say this … but I really do have a favourite child,” she posted. The mum explained that her three-year-old has been a struggle “from day one”. She says she’s more closely bonded to her toddler son – who is 18 months old. “I feel like I understand him perfectly and I am 100 percent the most qualified to care for him in any situation,” she writes. Admitting this strikes a chord in terms of her own upbringing, this mum hoped others might share their experiences. The overwhelming majority of parents who responded admitted they had felt just the same, and interestingly that their ‘least favourite child’ was sometimes the result of an experience of postnatal depression or birth trauma with that baby. Others noted that finding one child easier doesn’t make them a ‘favourite’, and that it’s more complex than that. 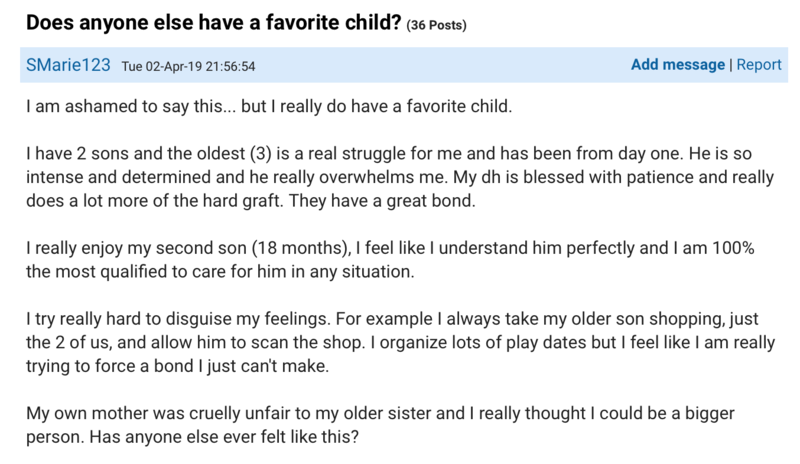 In the case of this mum, her ‘favourite child’ was also the youngest … and the ‘easiest’. “Please don’t think I love my first son less, I would lay down my life for either of them. In fact as he is much more sensitive I think I would actually worry/ care more for him. He is also more susceptible to illness,” the mum wrote in a follow-up comment. Turns out this is a very common situation within families and it’s often the youngest child that is deemed the fave. A 2017 study found that the baby of the family was seen by both parents and the children in the family as the favourite. While this might seem upsetting, Assistant Professor Alex Jensen, who conducted the study, says that parents shouldn’t overthink it. Treating all children with consideration, love, understanding and fairness is what matters, he explains. Professor Jensen says that children are individuals, and the way their parents respond to them will be equally unique. “If you focus on it being okay to treat them differently because they’re different people and have different needs, that’s OK,” Professor Jensen said in an interview with the Brigham Young University website. It’s also good to note that this sort of favouritism can sometimes be seasonal, and that parents should not feel terrible if they have a special affection for their ‘easy’ child or the child that is most like them. As this mum notes, she loves her firstborn child very deeply. But she finds spending time with her younger child much more effortless. “Our relationships with our children are not fixed. They are dynamic, growing and developing as we go through life’s joys and challenges. While one year, you might feel more connected to your oldest child, a year later, that affinity might switch to your middle child,” Tracy Asamoah MD writes for Psychology Today. She notes that these sorts of dilemmas are really opportunities for growth. Parents can work to strengthen the bonds that seem a little less effortless. Which is … exactly what this Mumsnet mum says she’s doing.